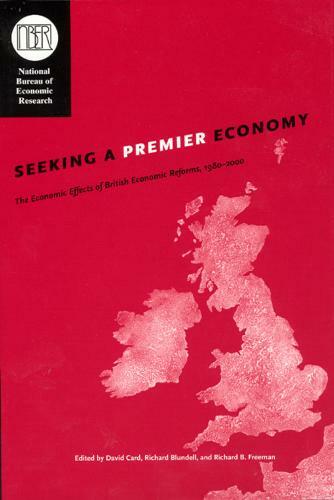 In the 1980s and 1990s successive United Kingdom governments enacted a series of reforms to establish a more market-oriented economy, closer to the American model and further away from its Western European competitors. Today, the United Kingdom is one of the least regulated economies in the world, marked by transformed welfare and industrial relations systems and broad privatization. Virtually every industry and government program has been affected by the reforms, from hospitals and schools to labor unions and jobless benefit programs. Seeking a Premier Economy focuses on the labor and product market reforms that directly impacted productivity, employment, and inequality. The questions asked are provocative: How did the United Kingdom manage to stave off falling earnings for lower-paid workers? What role did the reforms play in rising income inequality and trends in poverty? At the same time, what reforms also contributed to reduced unemployment and the accelerated growth of real wages? The comparative microeconomic approach of this book yields the most credible evaluation possible, focusing on closely associated outcomes of particular reforms for individuals, firms, and sectors.